Generation 1 Jungle Set - Pokemon Card Checklist	Overall rating:	3	out of 5 based on 1	reviews. 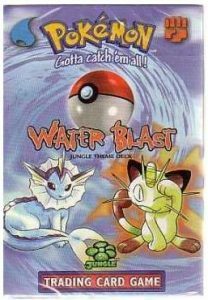 Pokemon Generation 1 Jungle Set is the second release by Wizards of the Coast in North America, released on June 16, 1999. The release was far ahead of what was intended, due to Topps also releasing a Pokemon set in the early summer. Like the base set, this release offered a 1st Edition print run, which sold out in under 2 weeks, and was replaced by the Unlimited version. The Jungle Set acts as expansion type release, to be played alongside the base set. Unlike the base set, it contains no Energy cards, and only 1 Trainer card. 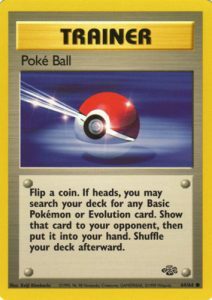 The size of the set reflects this lack of Energy and Trainer cards, with only 64 cards being included in the North American release. The original Japanese release from 1996 contained only 48 cards, but Wizards of the Coast decided to create non-holofoil versions of the original holofoils, so as to increase the set size, and reduce the odds of getting a holofoil card. 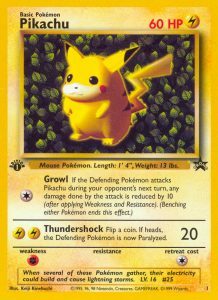 The 1st Edition printing also accidentally included a promotional version of Pikachu, which was subsequently removed from the unlimited version, making it a very rare and valuable card on the collectors market. Like the base set release, Generation 1 Jungle also includes special deck builder boxes, aimed at helping players build a better deck. These decks pulled not only from the Jungle release, but from the base set as well. As was the case with previous deck builder boxes, these each came with instruction book, damage counters, and special game coin.